Want to make a difference? Join our Social Action class on Saturday, May 5th at 9:00 am at Recycled Resources for the Homeless. 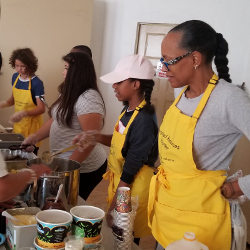 We will prepare and serve brunch, sort clothing donations, and distribute toiletry kits. Students and parents are welcome. The shelter is located at the rear of All Saints Episcopal Church 5619 Monte Vista St, Los Angeles, CA 90042. Email angelia @ urbanhomeschoolers . com with questions or to RSVP.